Harrison's Power Treats can be used for weaning, as transitional treats when changing a bird's normal diet, or as supplements for providing extra energy and sustenance. The Power Treats are beneficial to birds with a variety of complaints, including dry skin, balding and age-related illness. With antioxidants and essential fatty acids to promote general well-being. Feed 1 piece Power Treats per 3 pieces of Coarse Ground Formula. They may make up to 30% of diet. 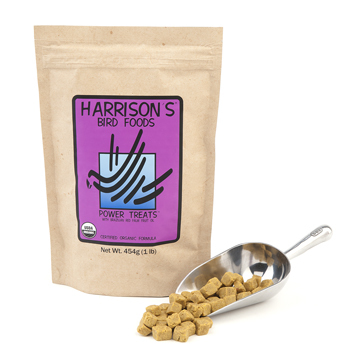 There are currently no questions for Harrison's Power Treats Bird Food - be the first to ask one!